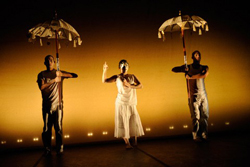 Founded by Fringe First Award winning actor/director/playwright Teo Castellanos, the contemporary performance company, Teo Castellanos D-Projects is a Dance/Theater company influenced by ritual, culture, spirituality, collage art, traditional and progressive music. Teo Castellanos D-Projects fuses ancient traditions with B-Boy choreography to create a new aesthetic in Dance Theater. Their first work Scratch and Burn, a peace ritual based on the war and funeral rituals of the Zulus of South Africa, was commissioned by Miami Light Project and premiered in Miami in 2005. It has since gone on to tour throughout the U.S., South America and China. Teo Castellanos D-Projects will begin touring their next piece, Fat Boy in January 2012. Fat Boy is an examination of world poverty juxtaposed with American consumerism, influenced by Balinese culture and Asian rice rituals. Fat Boy was co-commissioned by Miami Light Project, Tigertail Productions, 7 Stages and Hip Hop Theater Festival. choreography is hip hop based and is also influenced by Balinese Rice Rituals and Mythology, as well as traditional Buddhist ritual movement. The work also incorporates Dub Reggae music composed by Grammy-nominated DJ LeSpam and video projections of Asia and Africa. The touring company consist of 5 Artist and 1 Technical Director. This fee does not include travel/housing or $40 a day per diem per artist. Fat Boy is a dance/theater work exploring world poverty, hunger, American consumerism and waste. The core of its choreography is hip hop based and is also influenced by Balinese Rice Rituals and Mythology, as well as traditional Buddhist ritual movement. The work also incorporates Dub Reggae music composed by Grammy-nominated DJ LeSpam and video projections of Asia and Africa.